The Dustin and Kristen Yoder Memorial Foundation awarded its first college scholarship April 16th, 2007, at a banquet in the Geography, Planning, and Recreation Department at Northern Arizona University. The recipient was Jon David Pierson, who was chosen from a number of highly qualified applicants by the Foundation board. Jon is a trip leader for NAU Outdoors who has volunteered countless hours to conservation corp, youth corp, forest service, and trail association groups, as well as helping rebuild homes destroyed by Hurricane Katrina in New Orleans. He will be a senior next fall at NAU and is majoring in Parks and Recreation Management. Jon completed a mountain bike ride this summer from Mexico to Canada. The Dustin and Kristen Yoder Memorial Foundation also helped sponsor Mercedes Friend to attend the June 2007 NOLS Alaska Backpacking and Sea Kayaking Course. Mercedes is a 17 year old high school student from Flagstaff, Arizona, who is not only active in the National Honor Society, but is an accomplished swimmer and dancer. She also enjoys rock climbing, mountaineering, and running. She has returned from her course with a renewed appreciation of the great outdoors along with her new skills in guiding and outdoor leadership. According to her trip leaders, "her efforts among the group members brought her to be one of the three final leaders of the expedition". In Mercedes note of thanks to the Foundation, she wrote "To know that I can safely lead an expedition group of my peers for four days is an experience I don't think I could have gotten anywhere else. Everything about the trip helped me grow. I can't express how much your scholarship helped me and meant to me". The first scholarship for the NOLS Wilderness Medicine Course was awarded to Juliana Conley for the January 2008 course taught by Pete Walka in Flagstaff. This is a first responder course to prepare anyone who spends time in the wilderness with the necessary skills to stabilize and transport a sick or injured person in a remote area under all types of adverse conditions. Dustin and Kristen were both graduates of Pete's course. According to Pete, Jules "did an outstanding job during the course" and "demonstrated both the skills and compassion to be a great outdoor leader. She would not have been able to take the course without the support of the foundation", and he felt it had a "significant, positive impact on her outdoor career". Jules is a resident of Flagstaff and is very active in guiding and other wilderness activity in the area. The NAU Foundation in conjunction with the faculty of the Geography, Planning, and Recreation Department at Northern Arizona University awarded their Yoder Outdoor Leader Scholarship for the 2007-2008 school year to Rita Jane Seward. The 2008 NOLS summer scholarship for a wilderness course was awarded to Kelly Troy. The Yoder Foundation NAU scholarship for the 2008-2009 academic school year was awarded to Mason Daly. Mason was a junior in the Parks and Recreation Management Program at Northern Arizona University in Flagstaff at the time of the award. 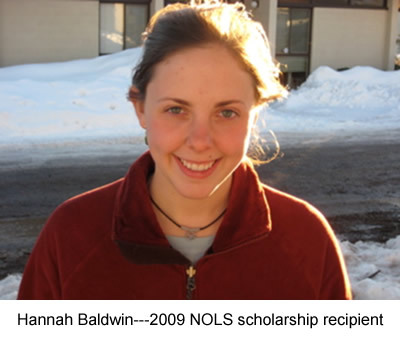 A scholarship was awarded to Hannah Baldwin to cover tuition to the January 2009 NOLS Wilderness First Responder Course in Flagstaff, Arizona. According to the course director, Pete Walka, "Hannah did an outstanding job during the course! She brought a bit of experience and a tremendous amount of enthusiasm to the course itself and to the other students in the course". The 2009 NOLS summer scholarship for a wilderness trip to Alaska was awarded to Madeline Friend. Madeline is a high school student from Flagstaff, Arizona, and is the younger sister of Mercedes Friend who received the Foundation's first NOLS scholarship in 2007. The Yoder Foundation Outdoor Leader Scholarship for the 2009-2010 academic year at Northern Arizona University in Flagstaff went to Cashea Arrington. Cashea has an extensive background of outdoor leadership working with the National Park Service and has won multiple volunteer service awards. After graduation in the Parks and Recreation Management Program at NAU in 2010, she is hoping to become a park ranger with the National Park Service. Scholarships for the 2010 NOLS Wilderness Medicine Institute course for Wilderness First Responders were awarded to Justin 'Pathe' Miller and Matthew Jenkins. Pathe is presently a senior in the Parks and Recreation Management program at NAU and is working with the National Park Service as an archeology technician in Walnut Canyon and Wupatki Monument. He plans on using his newly learned wilderness first responder skills this spring when he will be working with the National Park Service in Organ Pipe National Monument. Matthew is currently doing an internship in the Grand Canyon with the Student Conservation Association as a volunteer coordinator and restoration technician. He plans on working as a search and rescue ranger with the National Park Service and wrote that the course was "a wonderful opportunity that would have been impossible without the support of the Yoder Foundation". Again in 2010 we had several excellent candidates for the NOLS Wilderness Experience summer trips. One scholarship was awarded to Jakob Allmaras, a student at NAU, who will be attending an Alaska Mountaineering Course in Alaska. A second scholarship was awarded to Riyesh Nath, a high school student from New York, who will be going on a Wyoming backpacking adventure. Scholarships for the 2010-2011 academic year at Northern Arizona University in Flagstaff were awarded to Cashea Arrington and Stacia Kuehl. They are both enrolled in the Parks and Recreation Management Program at NAU and are planning on a career with the National Park Service. The Foundation awarded a full tuition scholarship to Daniel Trenchard for the January 2011 Wilderness Medicine Institute First Responder Course in Flagstaff Arizona. In a letter of thanks, Daniel stated, "I have seen many injuries in my outings and have never been able to do anything until now.. I am truly grateful for having this opportunity and would not have been able to do it without the help of the Yoder Foundation." At the spring meeting the Foundation board awarded tuition scholarships to Jamie Rae Bozicnik and Micky Lyn Zurcher. They are both in the Parks and Recreation Management program at NAU, and Jamie is a trip leader for NAU Outdoors. Scholarships to assist with tuition to NOLS courses this summer were awarded to Peter Costello and Kyle Marshall for the NOLS Absaroka backpacking course and to Aidan Blansfield for the NOLS Semester in the Southwest. Three scholarships were awarded for the NOLS Wilderness Medicine Institute first responder course. Leo MacCormack, Yarrow Corymb, and (Meghan) Rose Krayer each received full course tuition scholarships. Scholarships for the NOLS wilderness experience courses went to Reed Byg for a 2012 Semester in the Southwest course and to Anjanette Garcia for the 2012 Southwest Outdoor Educator course. Brittany Roberts and Bridgette Peterson each received $1000 to be used for tuition for the 2012- 2013 academic year at Northern Arizona University. Both are enrolled in the Parks and Recreation Management Program at NAU. The Yoder Outdoor Leader Scholarship was awarded to Blake McCord by the NAU Foundation. Blake is a Parks and Recreation Management major at NAU with plans to continue his leadership skills after graduation working for the National Park Service or NOLS. Holly Mikulas, Tyler Barnard, and Stephanie Calderon were awarded full tuition scholarships for the National Outdoor Leadership School Wilderness Medicine Institute first responder course. This course was given in January 2013 in Flagstaff. Scholarships for the NOLS wilderness experience courses were awarded to Samantha Dirks, Hannah Felker, Thu Huynh, Austin Sandoval and Richard Schwint. These students are all enrolled in the Southwest Educator, Semester in the Southwest, or Semester in the Rockies courses. Chase Lewine received $2000 to be used for tuition for the 2013-2014 academic year at Northern Arizona University. He is enrolled in the Parks and Recreation Management Program at NAU and expects to graduate in May of 2014. Chase also received the Yoder Outdoor Leader Scholarship awarded by the NAU Foundation. This year for the first time the Foundation partnered with the Ironwood Tree Experience in Tucson. ITE is a non-profit organization dedicated to providing young people from the community with active, fun, and educational experiences both in urban environments and outdoor venues. Their goal is to help these youth develop a respectful relationship with both nature and community and learn life and career skills which help them to make positive changes for their future. The Foundation awarded three full scholarships to Joseph Ianni, Alexander Heath, and Joshua Heath for an outdoor adventure trip to Costa Rica. There were three scholarships awarded to participants in the Wilderness Medicine Institute First Responder Course run by Pete Walka in Flagstaff, Arizona. Joseph Tumidalsky, Gianna Torres, and Christine Shiba each received a full tuition scholarship for the January 2014 course. Two awards were given by the Foundation to students attending NAU in the Parks and Recreation Management Program. Kevin Kennedy received a $500 scholarship and Thomas Rice received a $2000 scholarship to apply toward their tuition for the 2014/2015 school year. Thomas Rice was also awarded the Yoder Outdoor Leader Scholarship from the NAU Foundation. NOLS scholarships were given to Emma Houston and McClain Mehaffey. They were each awarded $1500 to be applied toward their tuition for the NOLS Semester in the Southwest Program. Alex Heath, Joshua Heath, Jacob Cooper, Ajang Deng, and Hannah Love were each awarded $400 to participate in the Ironwood Tree Experience Expeditionary Southwest Culture course where they studied and experienced firsthand the history and cultures of many of the early inhabitants of the Southwest. Madison Peddy was awarded the Yoder Outdoor Leader Scholarship from the NAU Foundation which was supplemented by a $1500 scholarship from the DKY Memorial Foundation for her studies in the Parks and Recreation Department at NAU. In addition five scholarships were awarded to pay for full tuition to the Wilderness Medicine Institute First Responder course given by Pete Walka at NAU. The five recipients were Elizabeth Bercel, Elinor Brereton, Colton Kemp, Felix Wharton, and Rachel Wroblewski. Scholarships were given to two students to attend the Ironwood Tree Experience Global Experience to Costa Rica trip in June of this year. The recipients were Jacob Cooper and Hannah Love. In addition three other students, Luis, Paloma, and Xochitl Gomez, were given scholarships for the Get Experience Backpacking Eco Program. In lieu of giving our own scholarships to students in the Parks and Recreation Management Program at NAU, the board decided from this point forward to make annual donations to the NAU Foundation which awards financial aid to students through the Yoder Outdoor Leader Scholarship. Our contribution each year will go directly to the endowment fund of the Yoder Outdoor Leader Scholarship, which in turn will increase the scholarship amount awarded each year. This year’s recipient of the Yoder Outdoor Leader Scholarship was Madeline Smith, a junior at NAU who is majoring in Outdoor Education and Leadership and plans to go into the field of environmental education. Alex Adrian was awarded $1500 to apply toward his Spring Semester in the Rockies course with the National Outdoor Leadership School (NOLS). He wrote “It is with the utmost gratitude that I write to you today. You may not know it, but you have played a key role for me in a life changing experience…Most importantly I learned that the simple things in life are the best, and that there is no better paradise than sitting around a campfire with friends.”.